» Was this a sign of something? Was this a sign of something? Looking west from North Albany on Jan. 2, 2014. 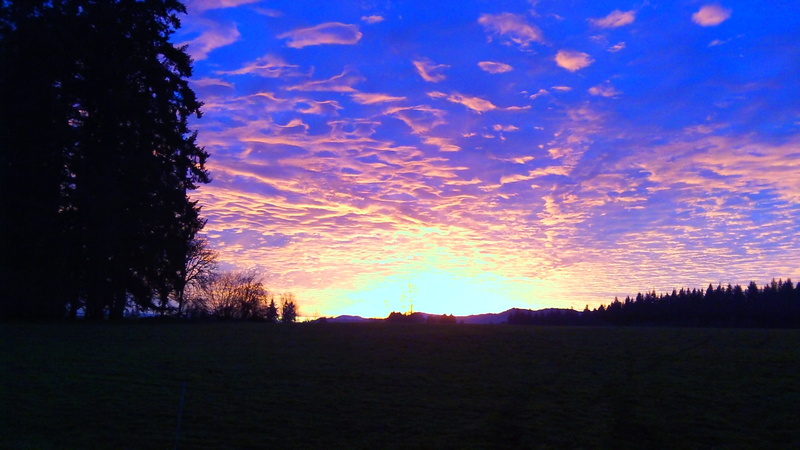 Everybody and his sister, in Oregon’s mid-Willamette Valley, took photos on Thursday night of the western sky. We all thought it was a spectacular sight,. What’s the meaning of this, somebody might have asked. We had barely seen the sun all day, what with the persistent fog. And here it was, giving us a colorful show late in the afternoon on the second day of the new year. It’s tempting to see some kind of omen. Wasn’t that brilliant light a sign of good things to come? Does it look as though 2014 will be a shining year in the history of mankind? Or the United States? Or Oregon at least? Can we now look forward to the rest of the year with confidence and hope? Is the economy finally going to cough up some new jobs that are based on something other than government borrowing money and then handing it out? In short, was that bright sky a sign that things are looking up, that everything will be rosy? Oh wait — the sky was bright not because the sun was coming up but because it was going down. So are we to assume that as a culture and a way of life, the West will continue its decline? I was one who took pictures! The colors got more intense the longer I was out but the photos did not do it justice. A blessing from God simply stated. curious if you’d allow us to publish in the colleges newspaper?